← Friday’s Foto Fun – More Puppies! Yes. I’m a worldwide sensation. Guess where I am today? I haven’t a clue. I’m a traveling kind of guy. I share my trips with you every Saturday. So come back often. Today I’ve taken a trip and never left the farm. I’m in Asia somewhere, but I haven’t a clue. 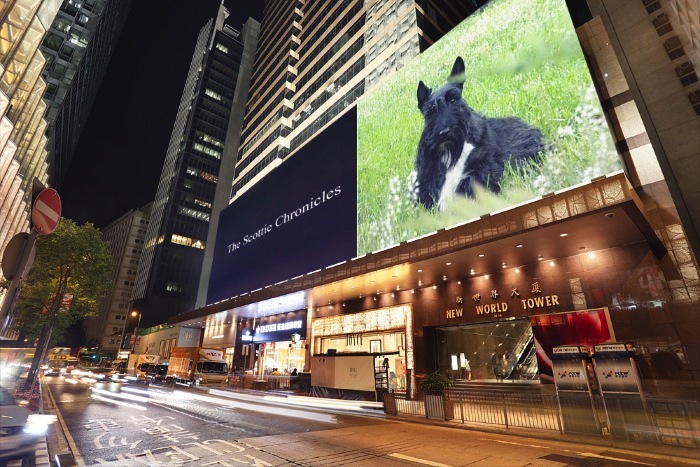 This entry was posted in The Scottie Chronicles and tagged dogs, funny animal photos, pets, Scotties, Scottish Terriers, travel, travel photos. Bookmark the permalink. 23 Responses to Where In The World? Your in your backyard. Williamsburg, Virginia! Great examples of colonial architecture. Then again, I could be wrong again. Love seeing you an a Jumbotron any which where! I do love a jumbotron! We will guess Shanghai????? Nice picture – in all your glory! Could be….I haven’t a clue sad to say! Another Saturday that we haven’t a clue as to where you are. It does look like a nice clean city, and your picture adds so much pizzazz to it! We will go with nordhuesn and say Shanghai! You might be right! Thanks for playing along! Hey you’re in Hong Kong! That was our 2nd guess. You may be right. Hong Kong is cleaner than Shanghai. That sounds good to me. OK. Hong Kong it is. Think you are in HOng Kong! I know I am wrong but NY? Maybe Chinatown? woooooOOOOO I haven’t a clue but thanks for guessing. you do get around Mr.Stuart….happy travels ! You are not in Florida. That’s for sure unless something changed down there. Easy – the Headquarters building of Angus Fala Worldwide Enterprises. And let me thank you for buying the billboard above our front door!